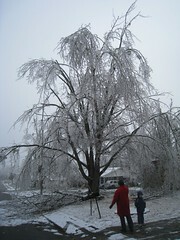 The week of January 26, 2009, Northwest Arkansas (and a lot of the rest of the upper South) was hit with a massive ice storm. People called it a “category 5” or “generational” storm. It did millions of dollars in damage to the area, which has been declared a state and federal disaster area. Personally, it was a VERY disturbing and motivating experience. We were out of power for 6.5 days (early Tuesday through the next Monday afternoon). We lost a number of large limbs from our lovely trees (we live in an old neighborhood with large mature trees), our electrical service was ripped off the house by a fallen limb, and our back porch cover was partially smashed. We’re still cleaning up the yard (and waiting for the crew our insurance company hired to remove the porch cover).